Bonn, 18 March 2014 – WhaleFest 2014 (www.whale-fest.com) aspired to be the world’s biggest celebration of whales and dolphins – and the event on 15 and 16 March in Brighton, UK, certainly was outstanding. Bringing together exhibitors from all over the world, celebrities and world class experts, an estimated 8,000 visitors used the chance to learn about the work of charitable organizations, go on a virtual whale watch and a virtual submarine trip, listen to inspiring talks and discuss marine life and its challenges with others. CMS and ASCOBANS, as co-sponsors of the event thanks to the kind support of Defra, UK, had a spacious exhibition area in the “Ocean Wanderers” zone. The main theme of this year’s display was marine debris, of which plastic is the biggest problem for migratory species. Entanglement in and ingestion of plastic waste are the most obvious dangers associated with debris, which includes discarded fishing gear as well as any other type of waste that ends up in the ocean intentionally or unintentionally. But also when broken down into very small pieces (microplastics), it is still harmful, as it gets swallowed and contaminates the food chain. Decorated with both litter and natural material such as shells found on Brighton beach, the stand encouraged discussion on the topic of plastic pollution. A new leaflet, “Oceans Full of Plastic”, was presented to the public; it contains helpful tips on how everyone can be part of the solution. The best thing is to prevent any litter from entering the ocean in the first place. Therefore reducing the use of plastics, reusing items where feasible and recycling them are so important. Another tip important for wildlife is to cut open any loops – this way, entanglement becomes much less likely in case an item somehow finds its way into the environment. And everyone can participate in local clean-up events along coasts and waterways. Several other organizations chose to feature the same theme, so that a strong message was given to visitors. 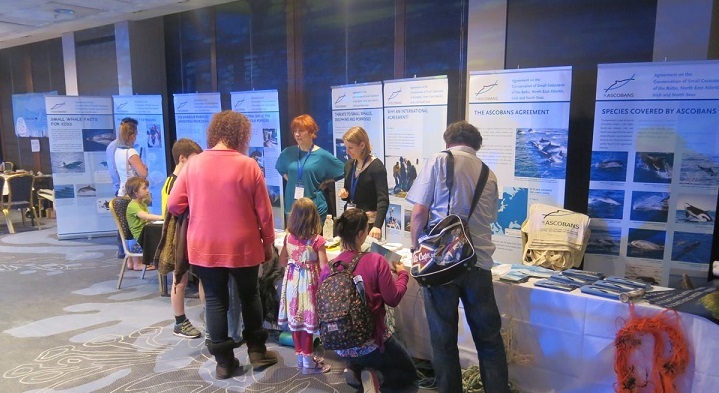 WhaleFest was also the opportunity to present an exciting new online resource for children to the public – ASCOBANS Kids (www.kids.ascobans.org), developed with the kind support of the Ministry of the Environment of Germany. This new website contains a vast amount of information on whales, dolphins and porpoises tailor-made for children under 14 years of age. The website is currently still a work in progress, with new material and features being added almost every day, but it was already very popular with the children visiting WhaleFest, many of whom spent time exploring it on one of the two computers kindly lent to ASCOBANS by the Zoological Society of London (ZSL).